It was 4am on a Tuesday morning and I was on my way to work, driving in the dark December morning. I am not used to getting up this early but we had to be at the airport for 6am to catch our flight to Atlanta, Georgia. I was happy to relinquish the wheel after picking up Wolfgang Pfenning; as the Pfenning’s farmer he is much more used to being functional early in the morning! I suppose the real question is, why was Wolfgang and I going to Georgia in December? The simple answer, Pfenning’s has been involved in developing a partnership with a farm located in southern Georgia. 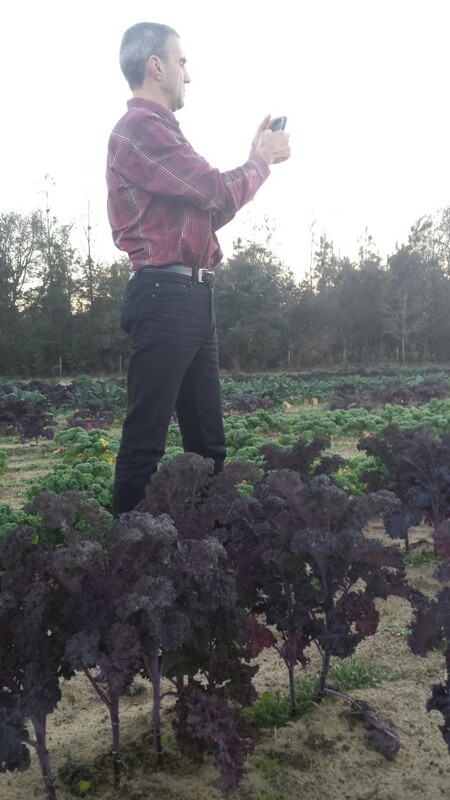 Farms in Georgia are able to grow very nice vegetables at a time in the year that compliments our growing season here in Ontario. During our peak growing season in the summer, Georgia is much too hot. Whereas, when our winter is fast approaching in November and December, Georgia’s weather is still warm and sunny. This nice Georgia weather continues well into our blustery, snow filled winter season. This partnership will allow us to extend the season for Pfenning’s brand vegetables into the winter. 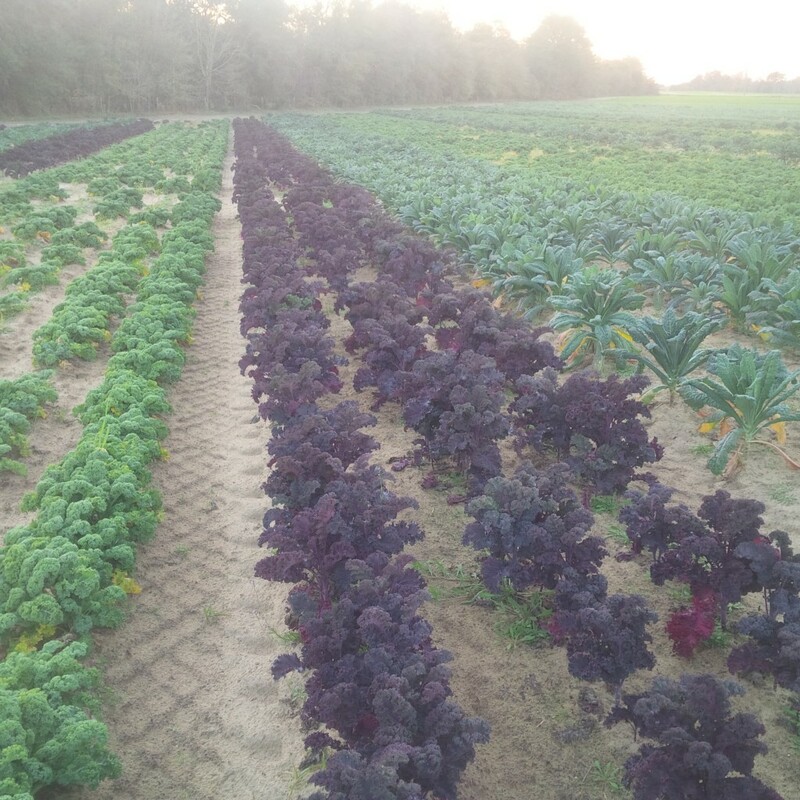 Working closely with this Georgia farm allows us to maintain our high quality standards and is a fitting relationship for us to develop, given Pfenning’s extensive experience in organics. Pfenning’s has helped this farm transition land to the Canadian Organic Standards. 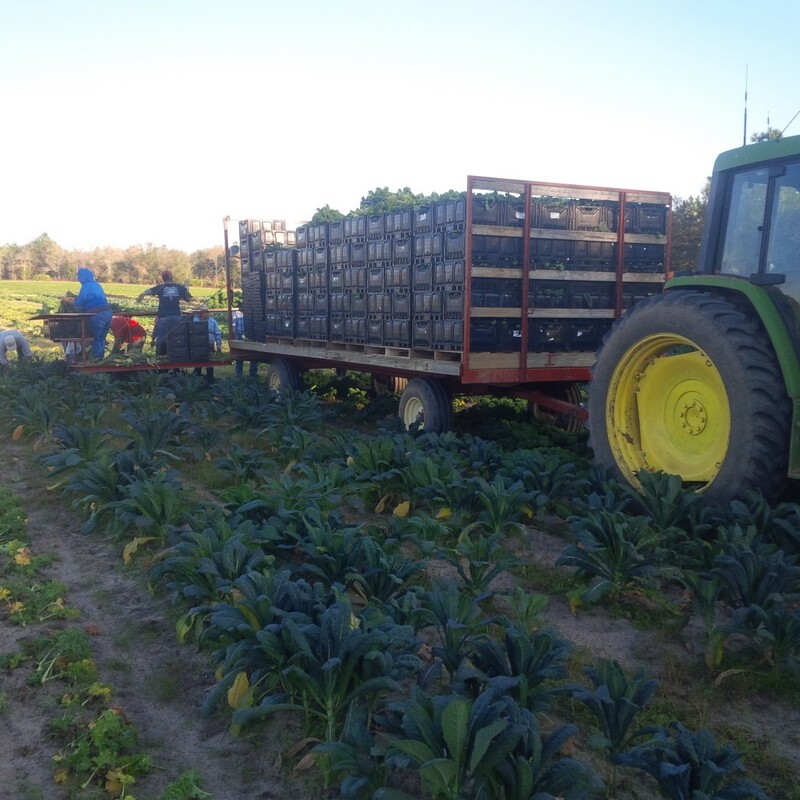 More consumers are demanding organic produce and that demand is being felt by all growers. The more land we can transition to organic the better we can serve that growing demand. We were very pleased to see the land opportunities in the southern U.S. and are excited to work with a company doing business there. Wolfgang and I arrived in Atlanta by noon, hopped into our rental car and began our journey to the farm. As we got out of the city on I75, the famous I75 that spans the U.S. from Detroit, Michigan all the way down to Tampa, Florida, we stopped at La Parrilla Mexican Restaurant. 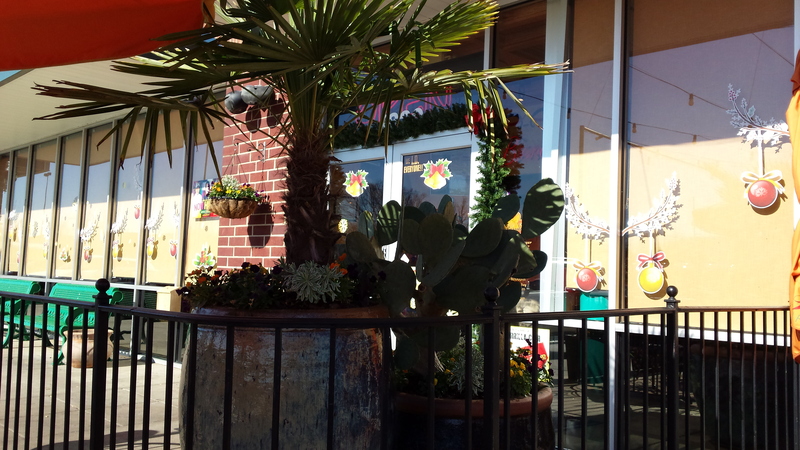 We were served delicious Mexican fare, enjoying our meal out on the patio in the 20C weather, bathing in the sun that we soaked in delightfully! It was strange to see Christmas decorations around the restaurant, for us Canadians it felt like Christmas in July. A sunny Christmas season in southern Georgia, U.S. Despite the heat and sunshine, the days are nearly as short as ours here in Ontario, so we were lucky to get to the farm as the sun was going down early in the evening. We caught just enough day light to go to the fields and check out the quality of the crops we would be harvesting that week. 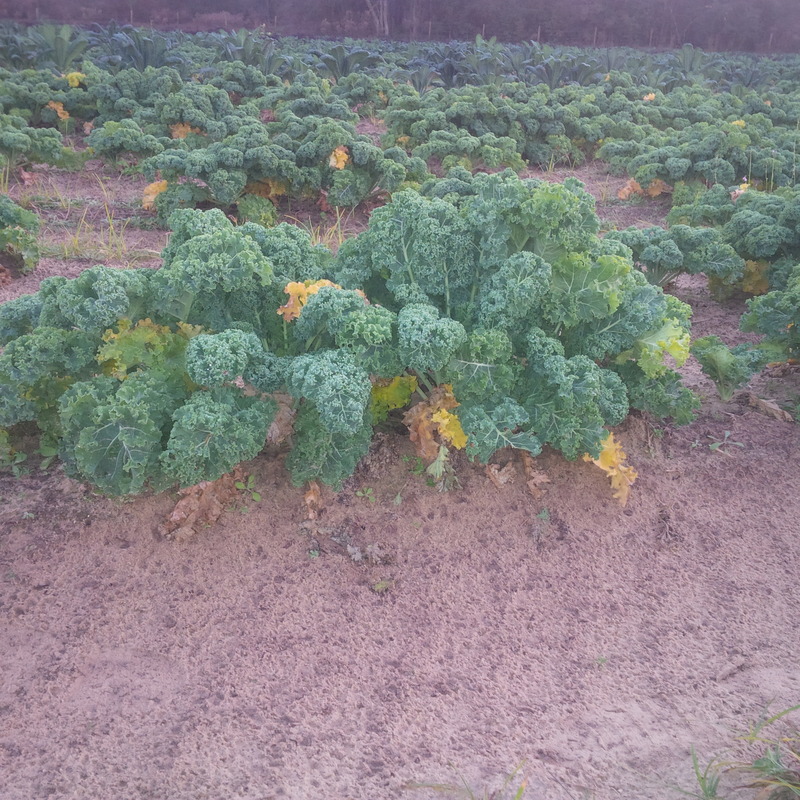 We were very satisfied with the growth of the kales, nice, big leaves with good colour development. Other crops showed uneven growth, with some areas having well formed plants and other areas showing stressed growth patterns. This was to be expected with the sandy soil quality of the fields. Sandy soils drain very easily and have a more difficult time holding on to the nutrients the plants need to grow. The result is often uneven growth in the field, where pockets of plants don’t grow at all, others grow perfectly, and yet others show signs of nutrient stress, like yellowing leaves. In organic managed fields we don’t use synthetic fertilizers that allow repeated nutrient applications to the crops in sandy soils. Instead we have to increase the organic matter in the soils over time so the soil can hold on to the nutrients and water the plants need to grow. Compost application is going to be very important for these fields to increase the organic matter needed. Wolfgang stopped by the compost piles to see their progress. We are hopeful these fields’ organic production capacity will increase over time, as we have seen this transformation on some of our own fields here in Canada. Due to the uneven growth we knew the harvesting would be slow going in the days to follow, but Wolfgang was hopeful there would be enough product for a full load to send to Canada. Wednesday, just before 7am and the sun is slowly making an appearance to brighten the sky. The harvest crew is scheduled to finish another order, so Wolfgang and I head back to the organic fields to plan the organic harvest. He decides the kales are ready, the broccoli needs to come out of the field before it flowers, and the spinach, while being very uneven, is not going to grow much more so we might as well cut what we can. Mid-morning and the harvest team arrives. This is a new project for the workers so we spend some time talking to the team about the project, organic agriculture and how to harvest and handle the crops we are harvesting that day. Julio, the team lead, does the translating for us as most of the workers are Spanish speaking migrants. What a great day we had in those fields! Wolfgang, with knife in hand, showed the team how to cut the veggies, teaching them which plants were ready for harvest and which ones were not up to our quality standards and are to be left in the field to help increase the soil’s organic matter. I spent the day up on the harvest wagon showing the team how to pack the different products into RPC crates. The sun was shining, the weather was warm and I was not sitting at a computer, I couldn’t ask for a better mid-December day! 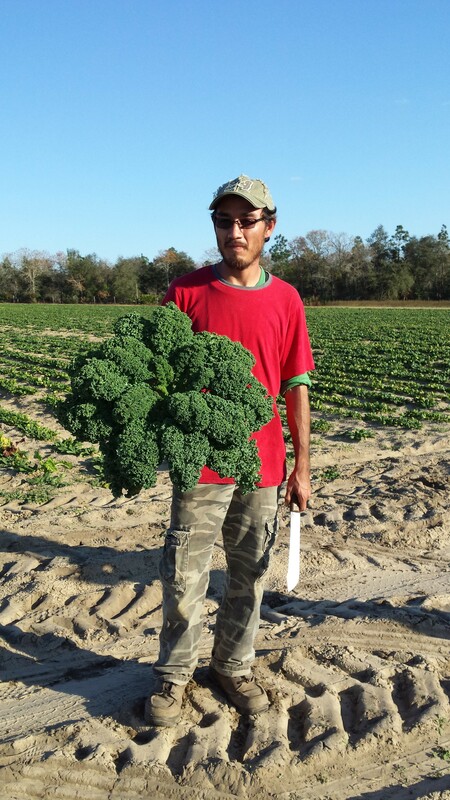 Alfredo wins the award for the largest green kale cut! 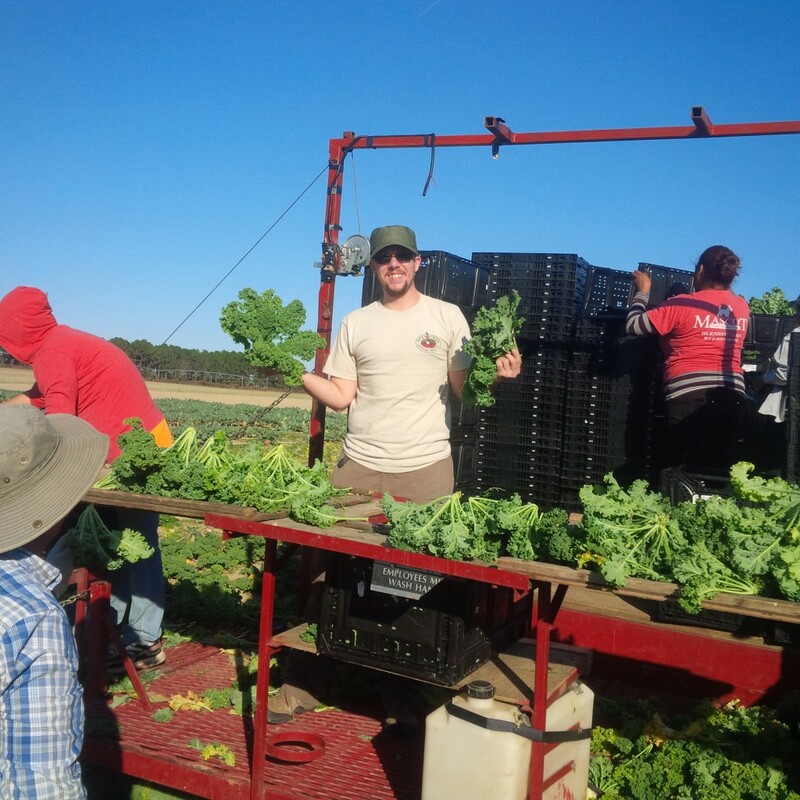 The harvest crew was really good at their jobs, they picked up very quickly how to properly harvest and handle the leafy green product. This was not surprising because these folks spend all year moving around the area working for different farms as different crops are ready to be harvested and packed. The broccoli was challenging because the ‘readiness’ of the head is indicated by the size of the overall plant, not necessarily the size of the crown. 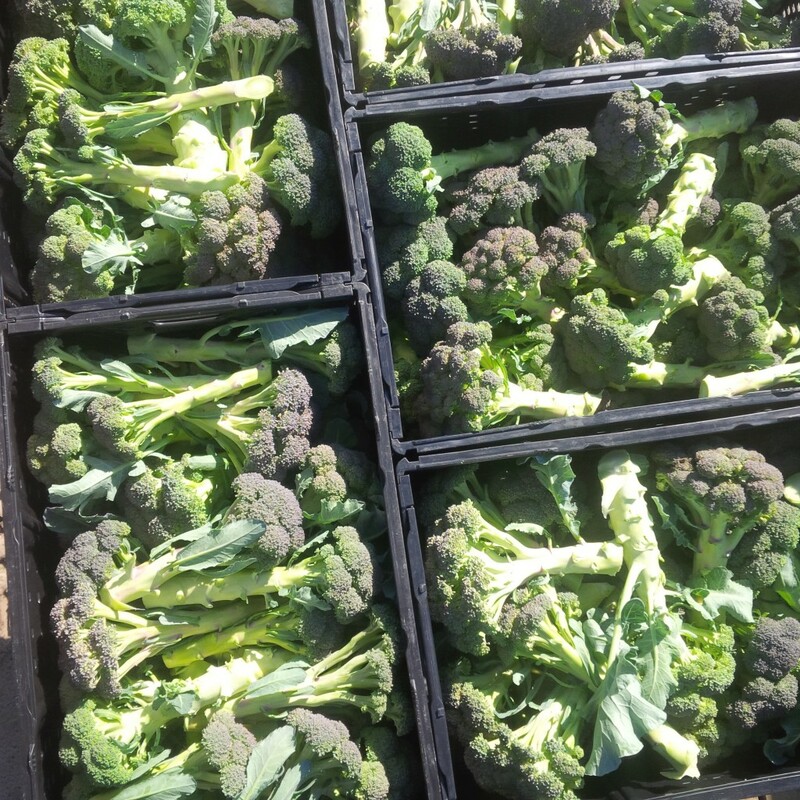 Well nourished broccoli plants will grow big leaves, a tall stalk and a large, dense crown to produce the most flowers. Stressed broccoli will try to grow quickly and flower fast before it’s nutrient stores deplete, producing a plant which has smaller leaves, a tall stalk and a small crown. 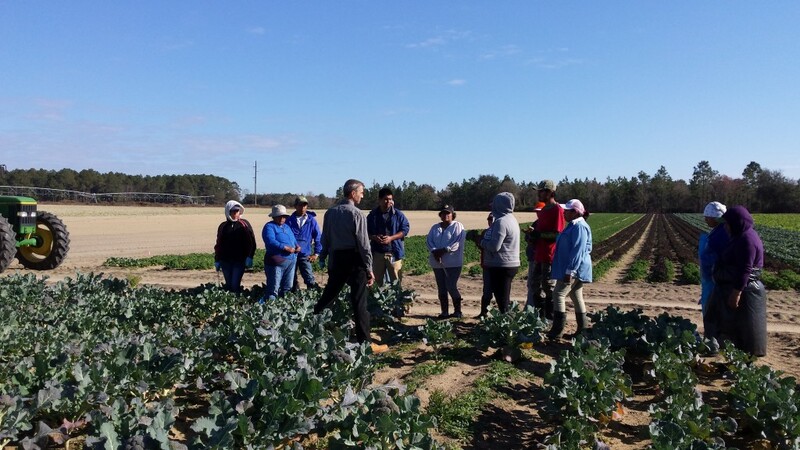 It took time for the cutters in the harvest team to learn which plants were growing well and would get bigger for the next harvest scheduled, versus which ones were going to flower soon and so needed to be harvested now. I was surprised to learn the harvest team members were not familiar with kale, a staple Pfenning’s product on our farms in Canada. I suppose this is not a product that is grown in the Southern U.S., or at least not one this team comes across to harvest in the local area, until now that is. I decided to make Kale Chips that evening so they could sample the delicious product they were harvesting. The next day was much the same, more kale, broccoli and spinach to harvest. We were shipping them to Pfenning’s bulk in the RPCs because we have the packing line infrastructure in Canada, which this farm does not currently have for leafy greens in Georgia. Wolfgang and I reluctantly left the farm late Thursday afternoon to drive back to Atlanta, confident the team was capable of finishing the harvest, to fill the truck scheduled for pick-up Saturday morning. 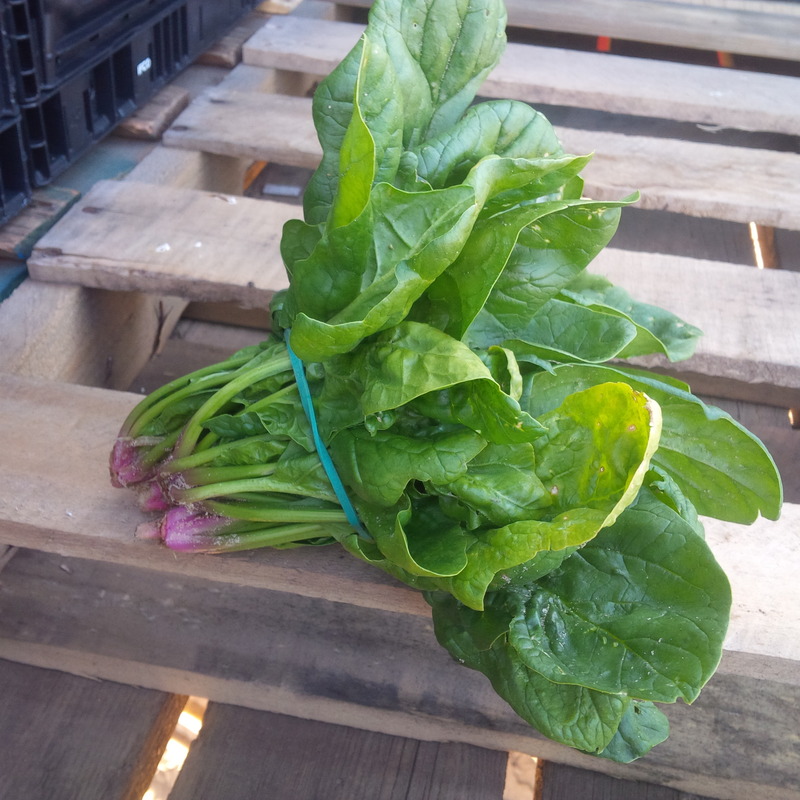 A bunch of spinach, hand picked in Georgia, U.S. The next harvest block was completed just after New Year’s, arrived to us here in Canada, packed by our crew and already sold! The product is proving to be popular and we anticipate another shipment in the coming weeks. We are excited for the potential of this project and are eager to see the reception of this product with our customers.